One of the reasons that make the recently concluded climate conference in Kigali, Rwanda, notable is that 197 countries came together here and signed the first legally binding climate treaty of the 21st century. 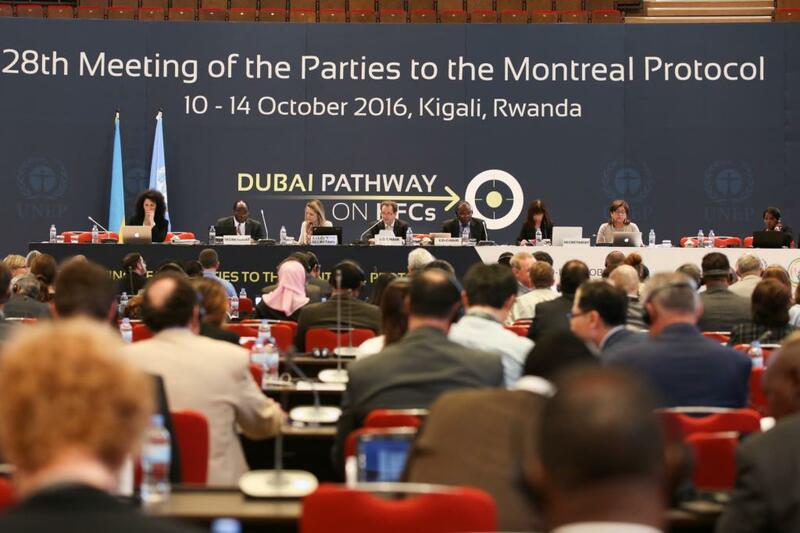 At the 28th Meeting of Parties of the Montreal Protocol, countries agreed to adopt an agreement to amend the Protocol to phase down the use of hydrofluorocarbons (HFCs). HFCs are refrigerants used in air conditioning and refrigeration systems. They are potent greenhouse gases with global warming potential (GWP) thousand times more than carbon dioxide (CO2). Montreal Protocol was signed in the early 1990s to eliminate the use of chemicals that caused the ozone hole. However, the replacement for the ozone-depleting chemicals was HFCs, which caused global warming. At the Kigali meeting, the world agreed to reduce the use of HFCs and move to refrigerants that neither cause global warming nor create an ozone hole. Under the agreement, developed countries will start reducing the use of HFCs first. They will be followed by China, along with many other developing countries. Finally, India, Pakistan and eight other countries of West Asia will follow suit. Currently, 65 per cent of all HFCs are consumed by developed countries with the United States alone accounting for 37 per cent of global consumption. China accounts for 60 per cent of global HFC production and 25 per cent of global consumption. India accounts for less than 3 per cent of the global production and consumption. This agreement, therefore, is the most differentiated climate agreement ever signed and is a reflection of the responsibility and capability of countries to solve climate change issues. Overall, the agreement is expected to reduce HFC use by 85 per cent by 2045. This will result in a reduction of HFC emissions equivalent to about 70 billion tonne of CO2 globally. This is equal to more than 12 years of total greenhouse gas (GHG) emissions from the US, world’s second largest emitter of GHG (historically, the largest). It is important to note that the much-feted Paris Agreement signed in 2015 is neither legally binding, nor are there mandatory emission reduction targets in it for countries. Under the Paris Agreement, countries are free to reduce emissions as much as they want and there are no repercussions for non-compliance. The Kigali Amendment to the Montreal Protocol is legally binding with mandatory targets for countries. Before the Kigali meeting, India was one of the four parties to submit a proposal to phase down HFCs. This was for the first time that India had put a proposal on climate change negotiations—we are known usually for reacting to other’s proposals. This proposal was not ambitious, as India wanted to start reducing HFCs 15 years after the starting date of the developed countries. The Indian proposal, therefore, had very little support from other developing countries. But about a year ago, India changed its strategy and started negotiating on the basis of ‘reciprocity’. That is, India announced that it would increase its ambition if developed countries, too, decided to reduce their use of HFCs at a faster speed. This was again a first for India. In climate negotiations, we have tended to demand that developed countries do more, without offering anything in return. Just a few days before the Kigali meeting, India proposed to advance its baseline years from 2028-2030 to 2024-26 if developed countries agreed to reduce their HFC use by 70 per cent by 2027 and provide greater assistance to the developing countries in terms of finance and technology. HFC consumption in the baseline years is used to calculate the maximum amount of HFCs a country can consume. Countries have to start reducing consumption from this ‘peak consumption’. India also started demanding a dual reduction schedule for developing countries: one for China and all those who wanted to align with China and another for India and other developing countries. This new proposal guaranteed to cut down HFCs emissions by more than two times compared to the previous Indian proposal. The proactive approach of India unsettled the negotiating strategy of the developed countries. Mid-way during the negotiations, though the developing countries agreed to a dual baseline, developed countries led by the US opposed it. It took another salvo from India to bring everyone onboard. On October 13, two days before the end of the meeting, India announced voluntary action to eliminate emissions of HFC-23 with immediate effect. HFC-23 is a super greenhouse gas with a GWP of 14,800 and is produced as a byproduct of HCFC-22. HCFC-22 is the most commonly used refrigerant in India currently. With this domestic action, India pledged to reduce the emissions of HFC-23 equivalent to 100 million tonnes of CO2 in the next 15 years. This announcement by India put an additional pressure on the US and China to respond, as these two countries are responsible for most of global HFC-23 emissions. In the final agreement, these two countries agreed to eliminate HFC-23 emissions, but only by 2020. This was a moral victory for India over the US as it demonstrated to the world that the US, the so-called champion of HFC reduction, was not exactly ambitious on climate change issues. Ultimately, it was a meeting on the last day between John Kerry, secretary of state, USA and Anil Dave, our minister of state for environment, forest and climate change which led to a deal, with India agreeing to 2024-2026 baseline and 85 per cent HFC use reduction by 2047. In return, developed countries agreed to reduce HFC use by 70 per cent by 2029 and 85 per cent by 2036. China agreed to a baseline of 2020-2024 and 80 per cent HFC use reduction by 2045. In the final analysis, the ministry of environment, forest and climate change was very well prepared for this negotiation. It was flexible and proactive. This resulted in an agreement that not only protected India’s economic interests, but also significantly reduced harm to the climate from HFC use and emissions. The proposal for the HFC agreement was pushed by the US from 2008 onwards. One of the main reasons for this was that the American multinationals—Honeywell International and DuPont Chemicals—had developed an alternative to HFCs, called HFOs. This chemical has gained “application patents” across the world. An analysis by the Centre for Science and Environment shows that the patent provision is such that no company can produce, sell or use these chemicals without license from these two companies. The application patent for HFOs is likely to result in billions of dollars in profits for these chemical giants. Firstly, India went with a clear strategy to start reducing the use of HFCs when the patent for HFOs expires. As the patent for these chemicals are slated to lapse in 2026/ 2028 in India, India deliberately chose 2024-2026 as baseline. Secondly, India linked its reduction schedule with that of the developed countries. Under the agreement, in 2029, when India will start reducing the use of HFCs, developed countries will reach an HFC reduction of 70 per cent. This means, by 2029 there will be greater technological optimisation and increased economies of scale for HFC alternatives to meet the needs of the developed countries. This will result in further reduction in costs for countries like India. The costs for the consumer of refrigeration and air conditioning systems in India, therefore, will not rise as a result of the HFC phase-down amendment. In fact, this amendment gives us an opportunity to increase the energy efficiency of our appliances significantly. For this, the Montreal Protocol will fund the Indian industry under the Kigali agreement. This agreement, therefore, is a great opportunity for Indian industry to chart a new environment-friendly growth trajectory based on non-fluorinated chemicals like hydrocarbons. Currently, price competitive hydrocarbon technologies are already available in the domestic refrigeration sector. Similarly, all large-scale foam manufacturers in India have moved to hydrocarbons. Additionally, in domestic air conditioning, more energy-efficient hydrocarbon systems are available for under 1.5 tonne of cooling capacity. They are a little expensive now (about 5-8 per cent more than HFC units), but with expansion in production these costs are likely to come down. The range of cooling capacity, however, is limited due to the concerns about the flammability of these refrigerants. But these concerns can be addressed with the help of added technological safety features, which are already available. While China is likely to grow using the fluorinated chemicals like HFOs, Kigali Amendment gives us the opportunity to become the hub for manufacturing energy-efficient and environment-friendly appliances based on hydrocarbons. Indian industry shouldn’t let go this opportunity.